I heard recently that the brother of someone in my art group passed away suddenly. An image formed in my mind immediately upon reading about it of angel wings on a purple background. Other images have popped in my head over the years and just as quickly popped back out again, but not this one. This image lodged there firmly in my mind and kept calling to me. When I finally got a chance to work on it, everything came easily. I used textile paints to create the background and it was exactly right on the first attempt, nothing too dark, no spilled paint, etc. 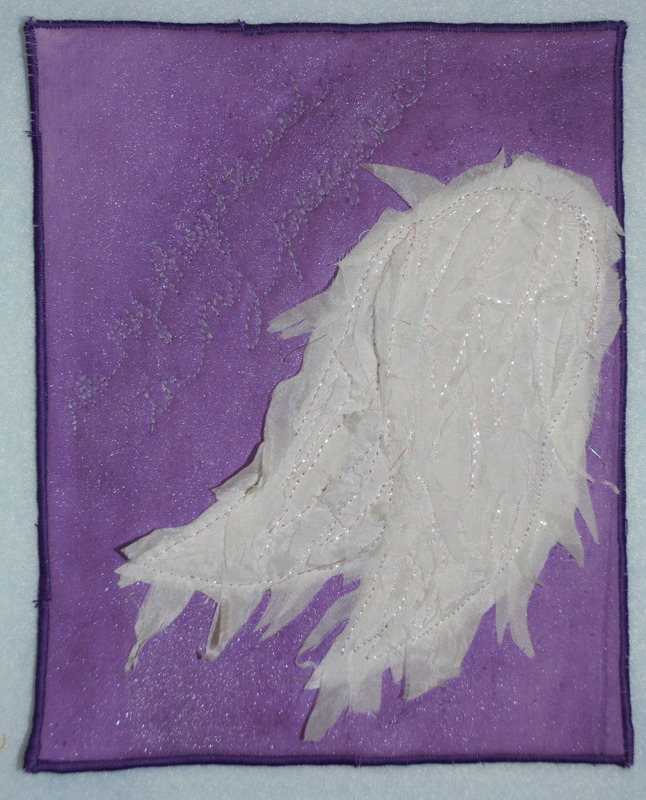 A few days later, I sat down to create the angel wings and had the same experience. I cut white silk to create feathers and sewed them down to a heavyweight stabilizer using Superior Threads’ Glitter thread and I didn’t even have any thread break. A few days after that, I sat down to quilt a message on the piece, “In my thoughts and in my prayers.” No thread broke during the quilting either and I didn’t mess up any of the letters. When was the last time this happened to you? When was the last time you had something in mind and were able to create it perfectly without so much as a broken needle? Yeah, I can’t remember either, which is why I think that these angel wings didn’t really come from me, but were a gift to a dear woman from someone beyond me. I was merely the construction crew.